We need our government to work for working people again. Congress needs to invest in our nation and get our economy growing again. Our government matters…to me, my family and my community. two profiles were found for Ourgovernmentmatters.org in social networks. Among other social networks the website is represented in Facebook and Twitter. The web server used by Ourgovernmentmatters.org is located in San Antonio, USA and is run by Rackspace Hosting. This web server runs 3 other websites, their language is mostly english. 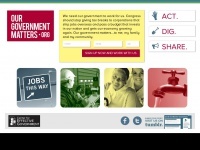 A Apache server hosts the websites of Ourgovernmentmatters.org. For managing the data of the webpages the CMS WordPress is used. The website uses the latest markup standard HTML 5. The website does not specify details about the inclusion of its content in search engines. For this reason the content will be included by search engines.